2018 has been full of speculation on the next big market crash. We’re now in our second correction of the year, which can cause a lot of doubt and selling among investors. While everyone has their own theory of why things are so bad, a few common themes have stuck out. First, it was inflation. Then, our economy was going to be ruined by a trade war. Most recently, however, has been the realization by investors that interest rates are going up. 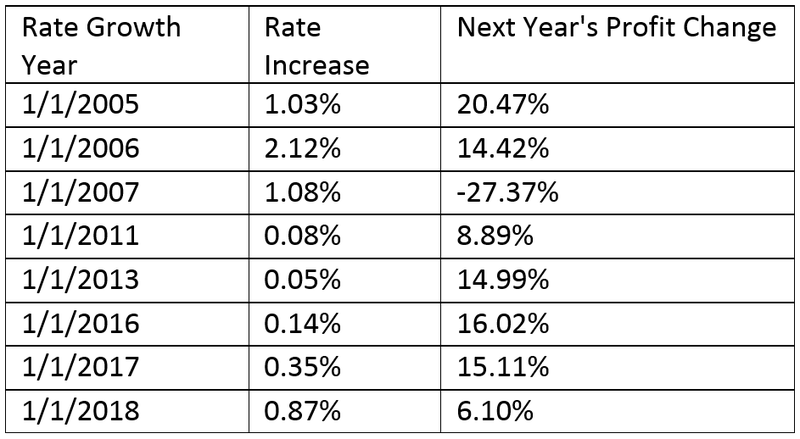 Despite the fact that we’re only at about 2.25%, the market is pricing in a level of rates that would actually slow down growth. This is partly due to the fact that the Federal Reserve has been extremely open to raising rates higher from here. However, with the current rates at 2.25%, it would likely take quite a bit more to have any meaningful impact. One of the most vital parts of any economy’s growth is the level of profit its companies are bringing in. And interest payments directly take away from profits. So, the fear surrounding interest rates is a rational one to have. After all, if companies aren’t making more money, what’s the point of investing in them? Since 2005, there have been eight years in which interest rates have gone up. However, they really haven’t had a bad effect on profit growth over the long run. Since 1970, out of 22 rate-hike years, only five saw a decrease in profits from S&P 500 Index companies over the next year. And 16 of those years had a higher rate than where we are at now 2.25%. Of course, there’s the threat of rising inflation as well. If companies are being charged more interest, the idea is they’ll have to increase prices. A lot of people are scared of inflation going to 3% or higher. Right now, it’s at 2.2%. And it’s stayed under 3% since 1995, even when interest rates have been over 5%. So right now at 2.25% interest and huge growth in corporate profits, the market has more than priced in a much worse scenario than we’re currently in. With the sort of revenue and profit growth we’re seeing, and the relatively low level of interest rates and inflation, this market dip is one to buy.